Looking for a delicious potato salad recipe? Using this recipe for Instant Pot Potato Salad, you will have the perfect potato salad for picnics and get-togethers. Once you try it, you’ll only use this potato salad recipe. Instant Pot potato salad will be the fastest potato salad you ever make. It is so easy to make and the recipe is so good, it will be the last potato salad recipe you will ever need. Can you cook potatoes for potato salad in the instant pot? It is very easy to cook potatoes for potato salad in the Instant Pot. When making Instant Pot Potato Salad, using the Instant Pot to cook the potatoes gives you perfectly cooked potatoes in four minutes. 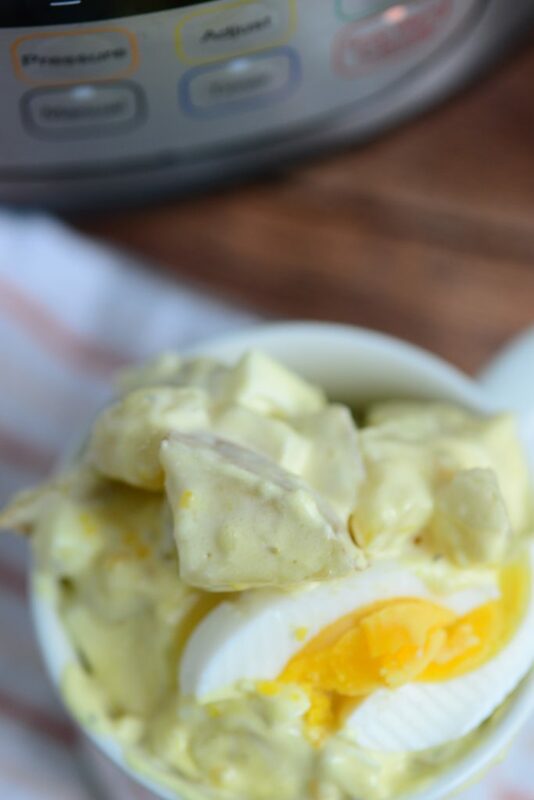 With Instant Pot potato salad, you will be adding hard-boiled eggs. 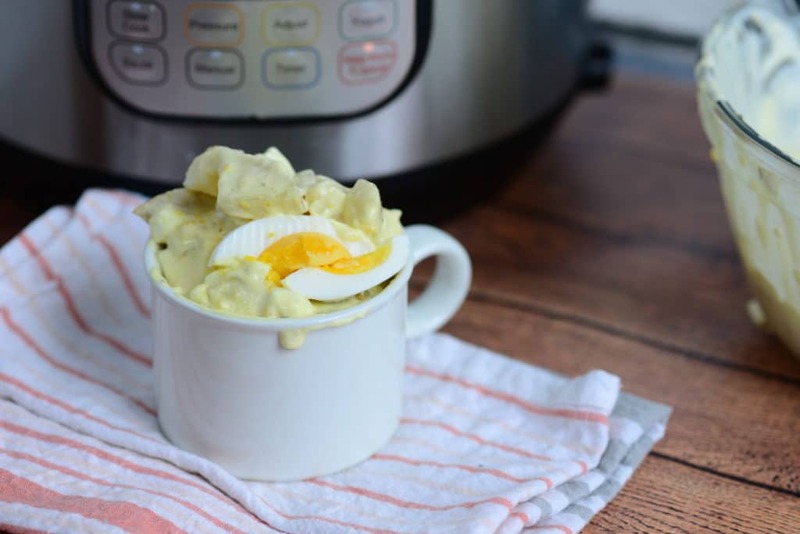 In this recipe, the eggs are cooked at the same time as the potatoes, but you can easily make hard-boiled eggs in the Instant Pot even without the potatoes. What are the best potatoes for potato salad? When making Instant Pot potato salad, you can use any type of potatoes. I prefer to use russet potatoes. The potatoes have a firm texture that is great in potato salad. How do you cook baked potatoes in the Instant Pot? 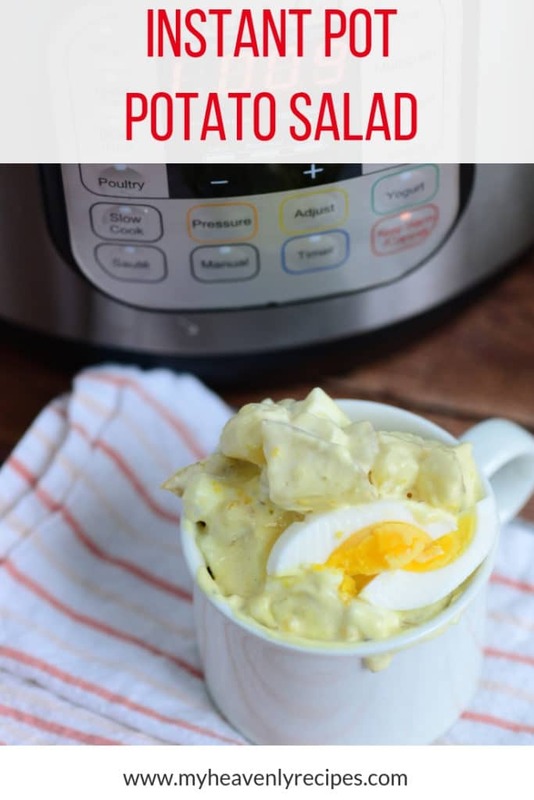 When you are making Instant Pot Potato Salad, you will be making baked potatoes in the Instant Pot. In order to cook the baked potatoes, you want to use the steamer basket. Put the potatoes in the steamer basket and put the steamer basket in the Instant Pot. Add water to the Instant Pot. This cooks the potatoes through. How do you steam potatoes in an instant pot? When you use the Instant Pot to make baked potatoes, you are actually steaming the potatoes. Using the steam basket, you add a small amount of water to the bottom of the Instant Pot. Add vegetables – Some potato salad recipes call for other vegetables like peppers, carrots or peas. Add pickles – My Instant Pot Potato Salad uses pickle juice. Feel free to add diced pickles as well. Spicy Mustard – Use spicy mustard instead of regular mustard. Don’t Have an Instant Pot? That’s ok. Cook the potatoes on the stovetop and use this recipe to make the potato salad. In a large bowl, combine the onion, mayo, parsley, pickle juice, and mustard. Add cooled potatoes and gently mix the mayonnaise mixture into the potatoes. Peel and dice three of the cooled eggs and stir into potato salad. Add salt and pepper to taste. If needed, add more mayonnaise to achieve desired consistency. Chill at least one hour before serving. Top with slices of remaining hard-boiled egg. Looking for a delicious potato salad recipe? 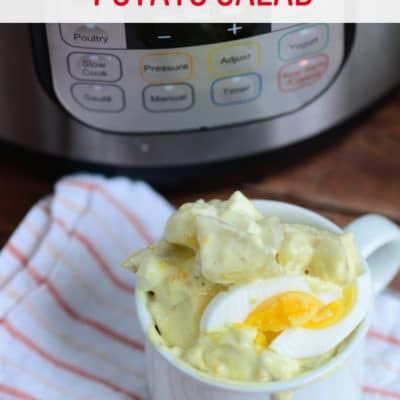 Using this recipe for Instant Pot Potato Salad, you will have the perfect potato salad for picnics and get-togethers. Once you try it, you'll only use this potato salad recipe.